What the lizardling empire lacks in creativity it makes up for in training. 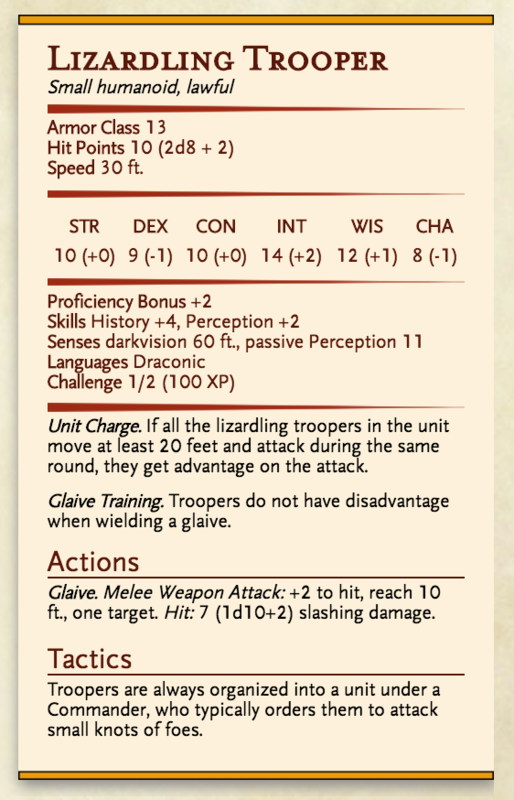 Its troopers train with long glaives for month after month until they can handle them as though born to them, despite the weapon’s large size. This gives the troopers up to a 10-foot reach on the battlefield. Troopers also train in a powerful unit charge, where they move forward as a group and deal significant damage. This is important, as a single strike from a more powerful foe can take out an individual Trooper. Troopers always remain organized into a unit under a Commander (statted out separately), who strides into combat and calls orders back to its unit. Each Trooper considers itself a member of its unit, even if it’s the only surviving member. Unit Charge. 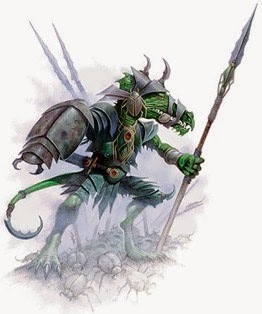 If all the lizardling troopers in the unit move at least 20 feet and attack during the same round, they get advantage on the attack. Glaive Training. Troopers do not have disadvantage when wielding a glaive. Glaive. Melee Weapon Attack: +2 to hit, reach 10 ft., one target. Hit: 7 (1d10+2) slashing damage. Troopers are always organized into a unit under a Commander, who typically orders them to attack small knots of foes.